Given that a quarter of America’s population live in rural areas where access to health care is difficult, telemedicine – the application of electronic communication technologies to connect health providers to each other and to clients – has emerged as an important tool in service delivery. In its “eMental Health and Telepsychiatry Practice Guide, California Telehealth Resource Center (CTRC) describes a variety of possible technology-assisted practices in primary care settings: specialist consultation services; client consultations; remote client monitoring; medical and health education; consumer medical and health information and telepsychiatry. In the latter, a psychiatrist generally uses technology to interview and assess clients and either directly provides treatment to the client or provides consultation to the client’s primary care physician. CTEC’s web site includes analysis of California policy issues and useful guides including their Reimbursement Handbook. At the national level the Center for Telehealth and e-Health Law, is a leader in telemedicine public policy analysis. In California, the UC Davis Center for Health and Technology, launched psychiatry telecommunication services to treat patients in remote areas and has reported high levels of client satisfaction with the process. For a discussion of telepsychiatry applications, see “Clinical and Educational Telepsychiatry Applications: A Review” by Donald Hilty MD et al, The Canadian Journal of Psychiatry, Vol. 49, #1, Jan. 2004. A 2007 randomized study by R. O’Reilly et al. entitled “Is Telepsychiatry Equivalent to Face-to-Face Psychiatry?” found that “psychiatric consultation and follow-up delivered by telepsychiatry produced clinical outcomes that were equivalent to those achieved when the service was provided face to face. Patients in the two groups expressed similar levels of satisfaction with service. 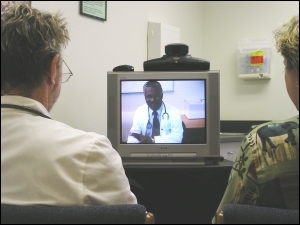 An analysis limited to the cost of providing the clinical service indicated that telepsychiatry was at least 10% less expensive per patient than service provided face to face.” Similarly, a 2006 study by Arrendondo De Las Cuevas found no statistically significant differences between telepsychiatry treatment through videoconference vs. face-to-face psychiatric treatment. Another method of remote communication, for those with established electronic record-keeping, is discussed in the California Healthcare Foundation’s paper “Safety Net Providers Bring Patients On Line“. Several early adopters describe opening portals for patients, allowing them to access personal information; conduct health-related transactions with their providers, like appointment-scheduling and refilling medication; access health educational materials; and participate in health related on-line social networks. The Telehealth Start-Up Resource Guide (2014) provides an overview and framework for implementing telehealth in rural areas. The Center for Integrated Health Solutions has designed a six-session on-line Telebehavioral Health Training and Techinical Assistance series to help safety net providers and rural health clinics understand and adopt this mode of service.